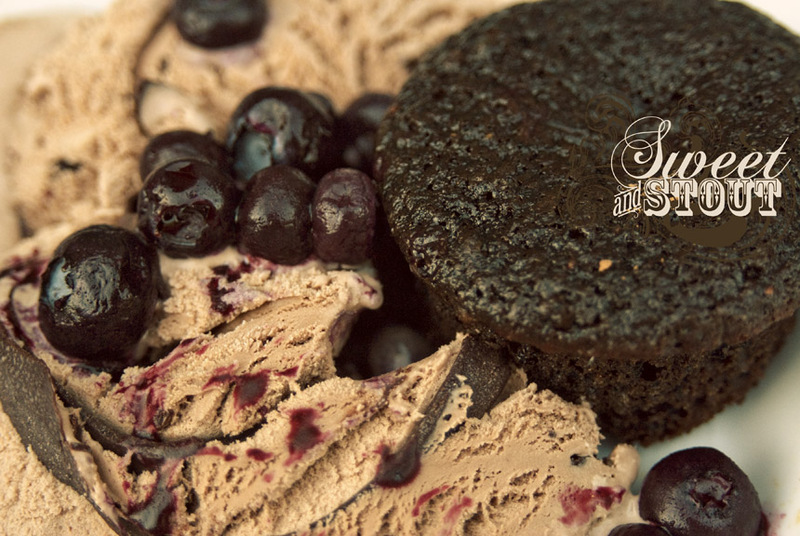 Blueberries and chocolate combined is entirely underrated. It is a fantastic combination of flavors, and I highly recommend trying it. 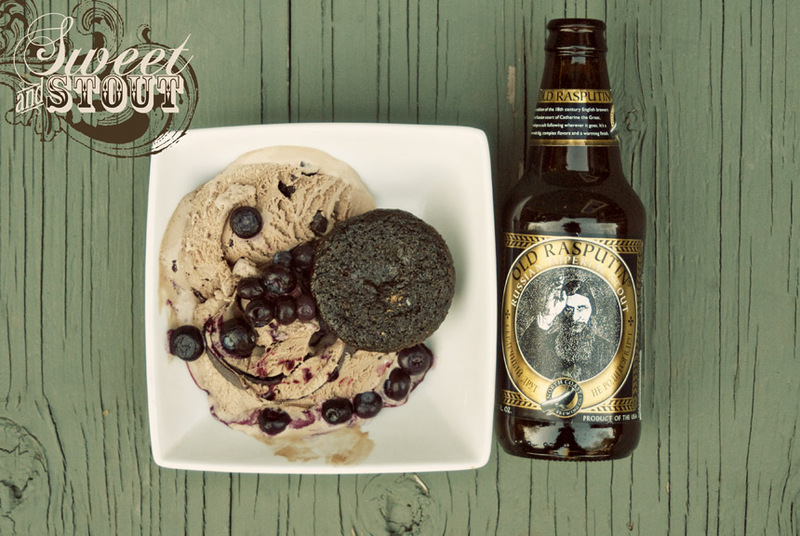 This weekend we created a chocolate cake using North Coast Brewing’s Old Rasputin Imperial Stout, and combined it with some frozen blueberries, best idea, ever (maybe). Not only is blueberry and chocolate a great combination, this beer is spectacular. 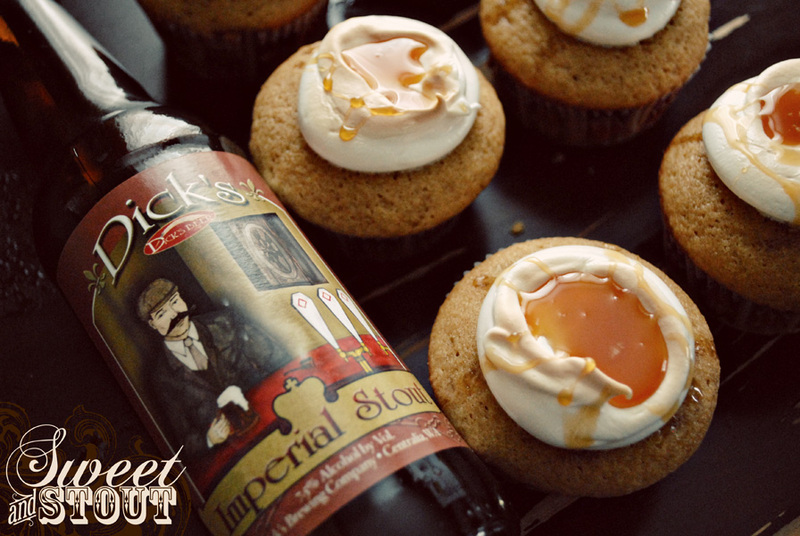 Old Rasputin weighs in at 9% ABV, so even after a half bottle (1 half for cupcakes, 1 half for me), I was feeling pretty tipsy. The cake itself was a basic chocolate, the only thing different was that we added in about a cup of blueberries and we puréed them in a blender before adding them into the batter. The cake turned out dark and delicious with a hint of stout flavor and blueberry. Perfect. What didn’t work out great for me was the frosting. I was avoiding making a trip to the grocery store, so I used the butter and left over cream cheese I had on hand. Well, I guess the butter wasn’t too happy with my blueberries and lemon I added to it, and the frosting separated before I could even get it on the cakes. Being that it was a beautiful, summer-like day, here in Spokane, I decided to pair the cake with some Tillamook Mudslide ice cream and forgo the frosting all together. 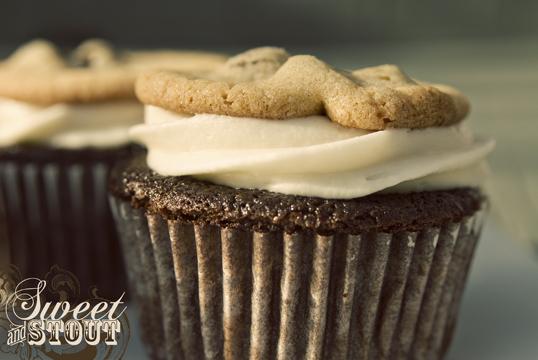 Sometimes, cupcakes don’t need frosting, and this was definitely an awesome alternative! I topped the dish with some thawed blueberries, and now I can’t wait to go back and have more. Our favorite day in March is rapidly approaching, St. Patrick’s day! 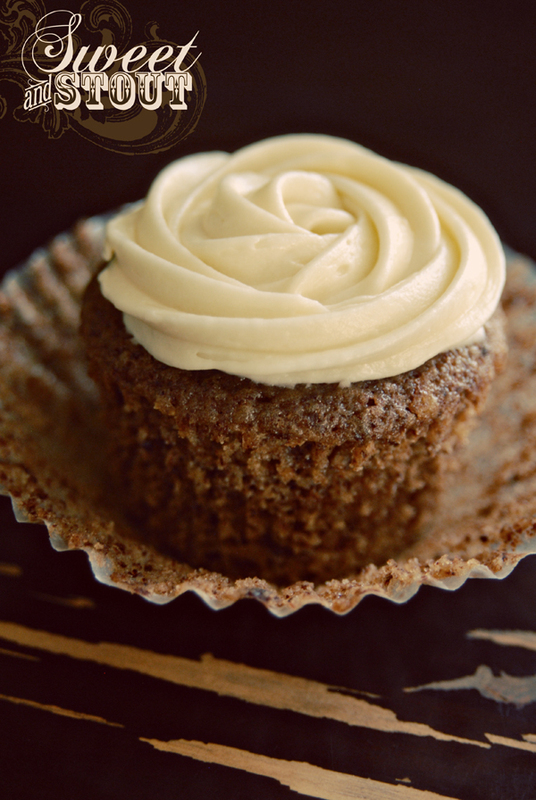 We started this blog almost a year ago, and to get into the holiday spirit, we made these Chocolate Potato cupcakes, inspired by the traditional Irish dessert. 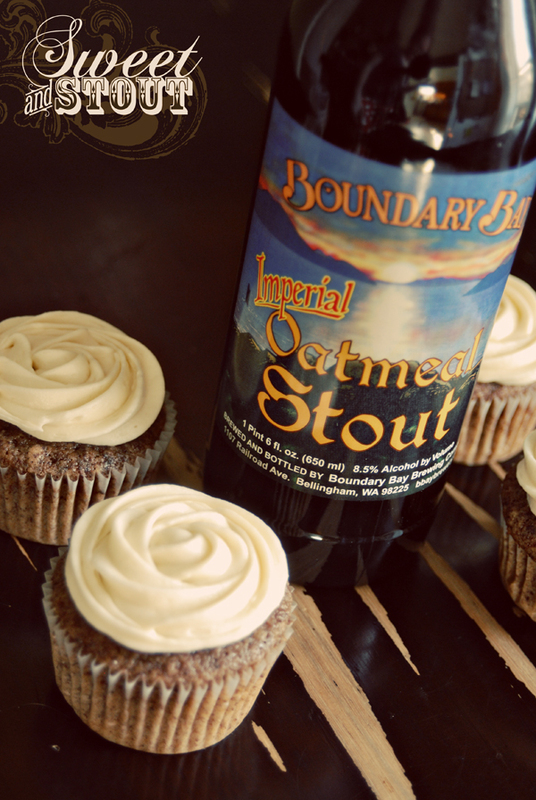 For the beer this week, we were lucky enough to receive a bottle of Boundary Bay’s Imperial Oatmeal Stout from Dylan’s dad (who lives in Bellingham, where Boundary Bay is located). I wish we could find Boundary Bay’s beers in bottles here, this beer is fantastic! You can find some of their beers on tap around Spokane, so we’ll have to settle for that. 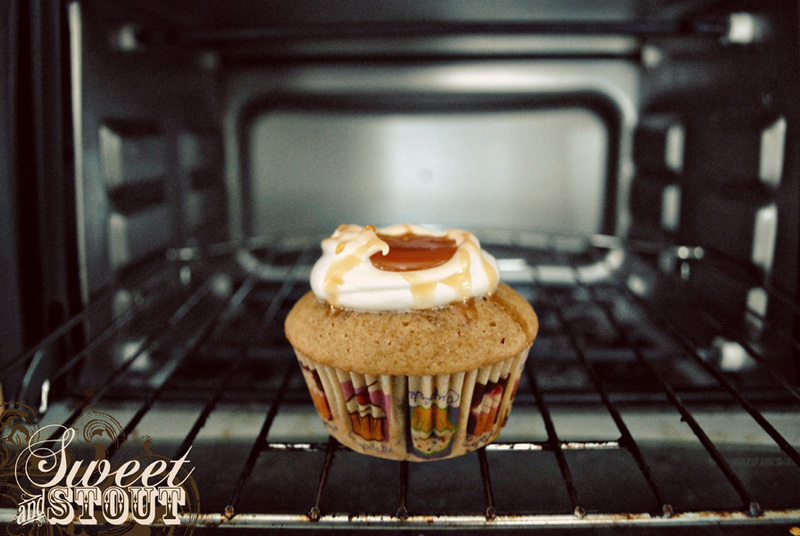 I know we did a sweet potato cupcake last year, so I was pretty sure that a potato version was going to turn out just fine. 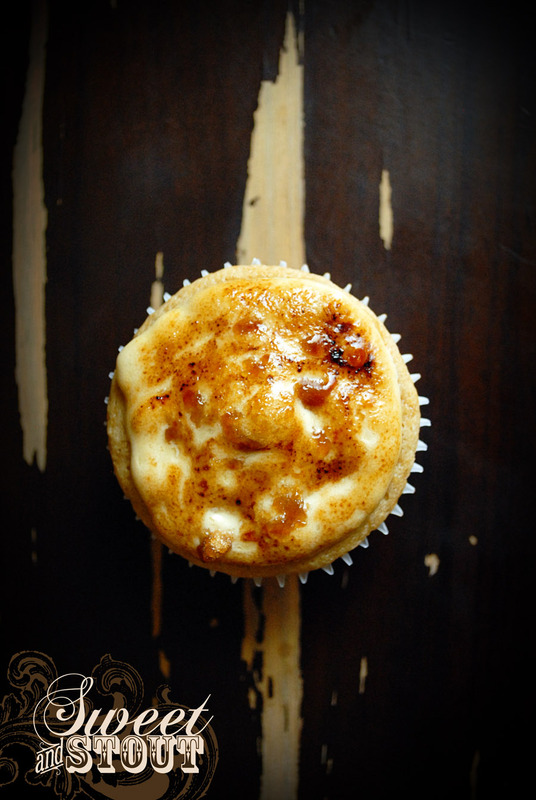 I was a little worried after last weeks cupcake experiment, I didn’t want two bad posts in a row. Thankfully, the potato and chocolate cake turned out fabulous. These cakes are dense and hearty, pretty sure it has something to do with the riced potatoes that I put in there. Ricing potatoes without a ricer is a bit time consuming though, I had to run those bad boys over our tiny cheese grater to make sure there were no lumps. They have just a slight hint of chocolate flavor, despite the 2 1/2 ounces of baking chocolate I put in them (also grated the chocolate over the cheese grater, when will we ever invest in a food processor?!). To top them off I went with a classic cream cheese frosting. I was not going to try and get all fancy this time, and I stuck with what I know. It was a good choice. The frosting doesn’t overpower the cake, which lets the cake flavor be the most prominent. Next week, if you’re in the Spokane area, you should join us at the #foodie tweetup going on over at Launchpad on Monday, March 12 from 5:00 pm – 7:00 pm. We’re going to be using you all as test subjects for a new flavor we’re working on, plus there will be all kinds of other cool people there with tasty treats to share (Savor Sweets and Farm Girl Gourmet, plus wine pours from Nectar Wine!). I can’t think of a better way to spend a Monday evening, hope to see you there! I don’t know why more people don’t love coconut. 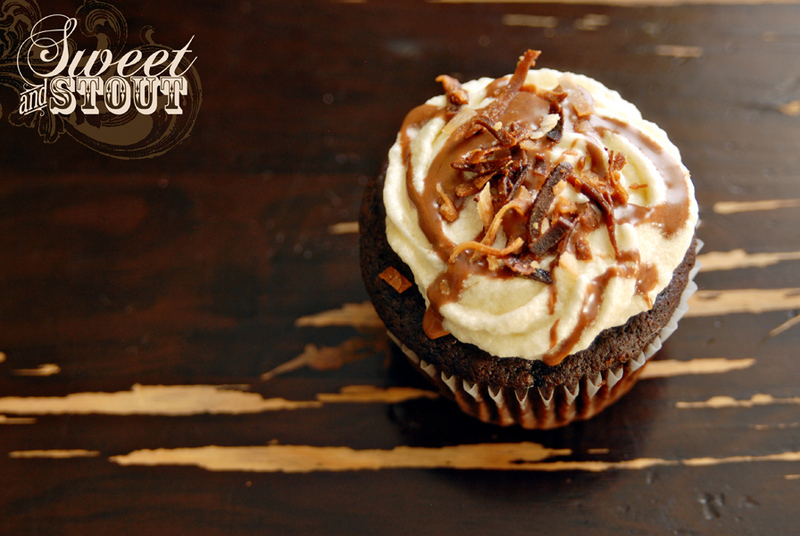 It’s a great flavor, and it pairs especially well with chocolate (the greatest flavor, ever). 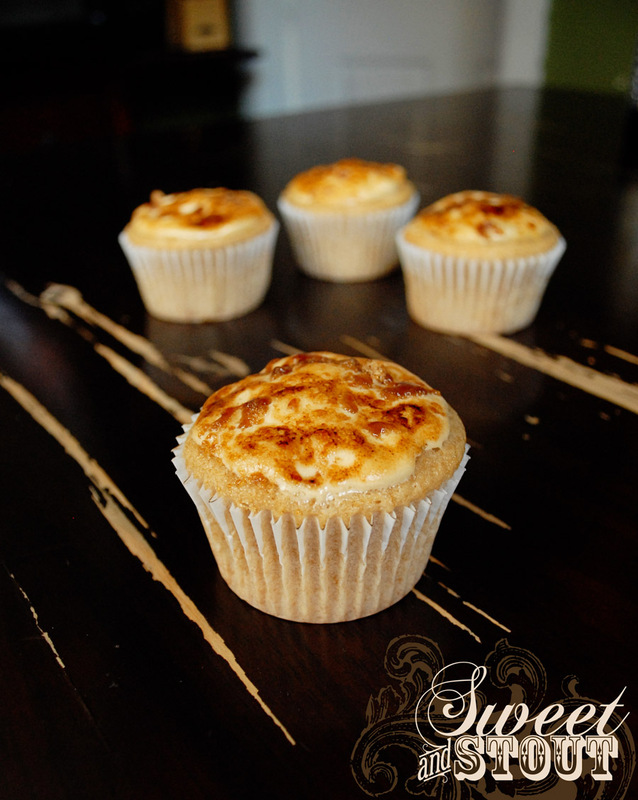 This week we made these Mocha Coconut cupcakes based off of a recipe that I found on Pinterest from How Sweet It Is. Are you on Pinterest? There’s a wealth of creative ideas, just waiting to inspire you over there. You can find me (Jackie) on Pinterest here. 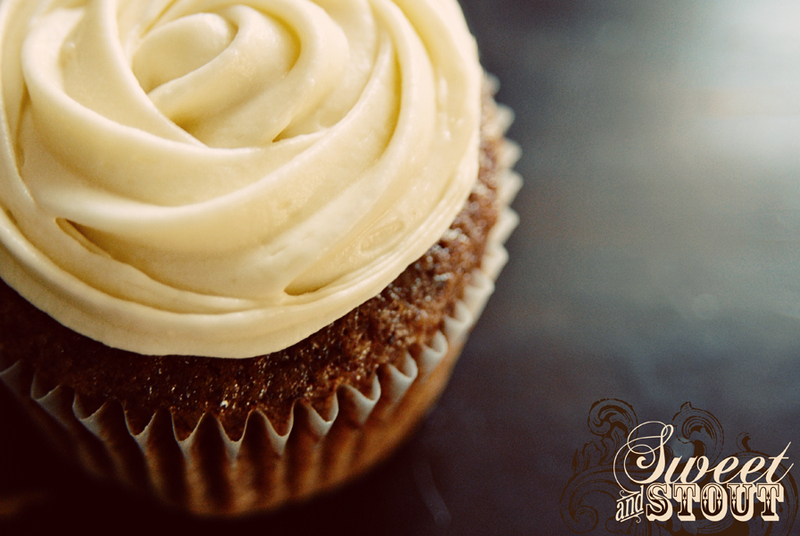 (I share all kinds of ideas, including cupcakes, of course!) I’ll wait while you go check it out, but hurry up, I can’t promise there will be any cupcakes left over by the time you get back. Back to these tasty cupcakes. 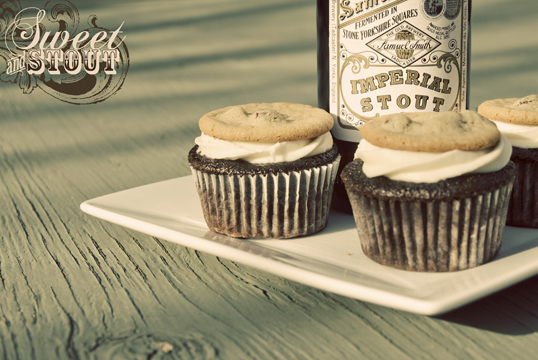 We had to modify the recipe to incorporate the beer, of course. After a trip to the beer store, (always fun on a Sunday morning!) 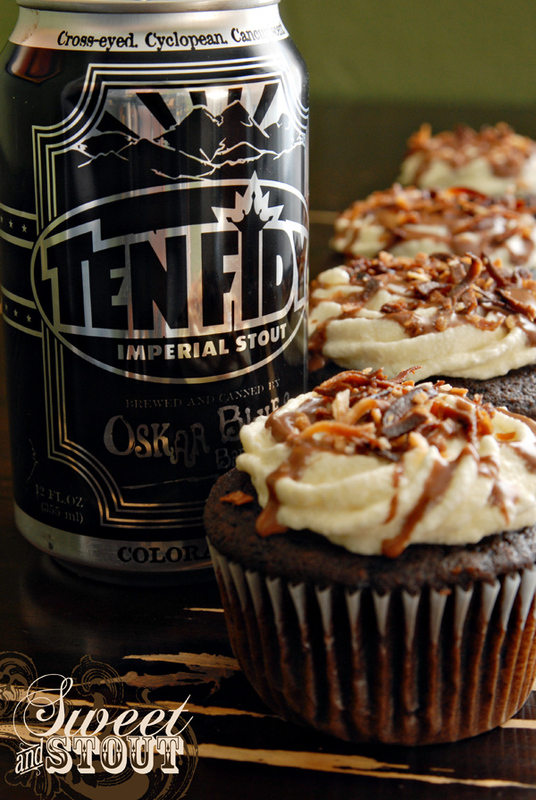 we decided to go with Oskar Blues Ten Fidy, a fantastic imperial stout. This was the first time I’ve had this beer, and let me tell you, I fell in love with it. It’s a thick, malty stout that hides it’s alcohol content (10.5%) VERY well. Half of the can went into the cupcakes, and the other half went to me. Let’s just say, I was feeling toasty myself before noon, but (as it was pointed out by a friend on Untappd) it’s Superbowl Sunday, therefor holiday drinking rules apply. The cake batter alone was fabulous, thankfully I did manage to bake it into a dozen cupcakes (instead of eating it all). The frosting was a buttercream with added coconut milk and flake for flavor. 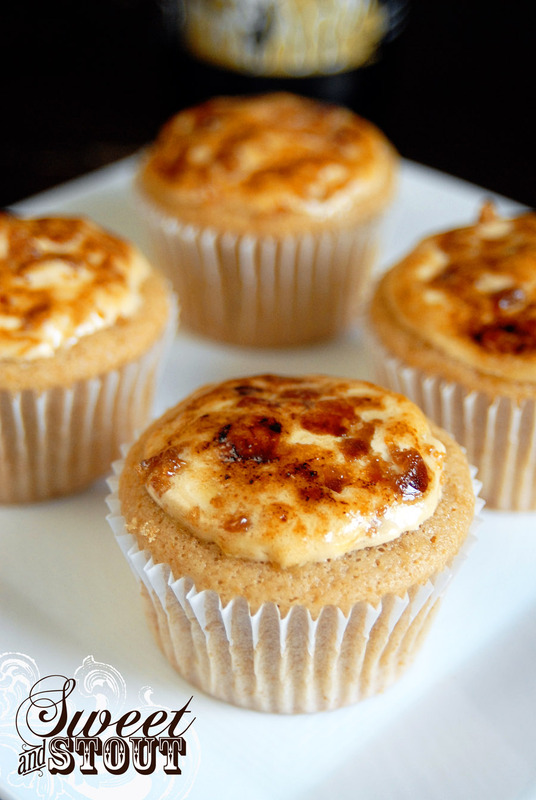 The recipe also has a chocolate mocha syrup to drizzle on top, and I toasted some coconut flake to top it all off. 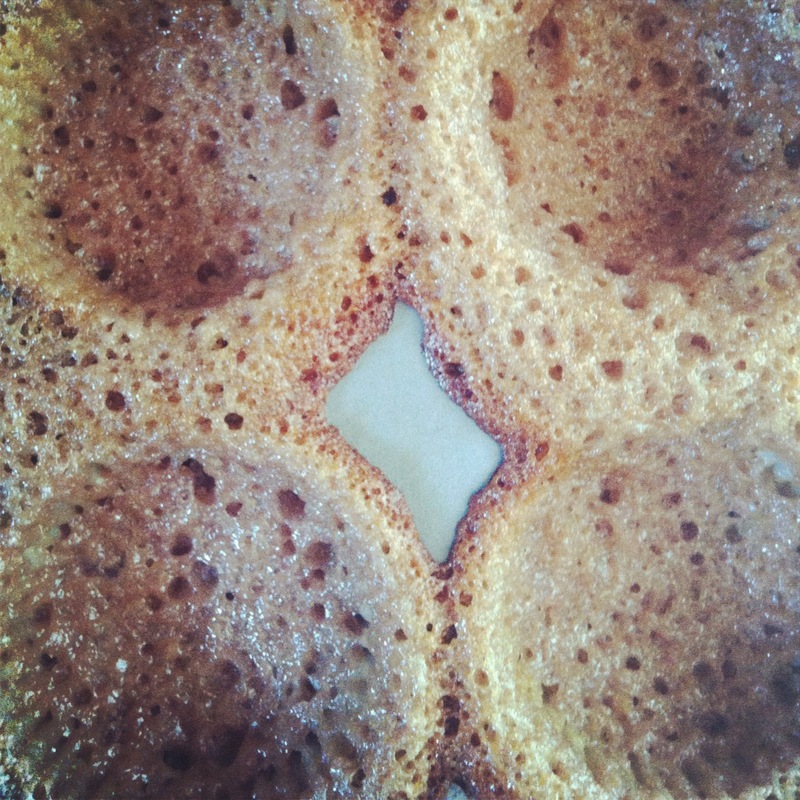 I’m not sure what I did, but the frosting started to separate before I could get it on the cupcakes. I did my best to get it back together, and lucky for me, it still tasted fabulous on top of the cake. After messily compiling all the frosting components, I sampled the whole package, and it was excellent. Imagine soft, dense, chocolate cake with creamy coconut frosting with a hint of toasted chocolate coconut all together in your mouth. Honestly, if any of these make it into work tomorrow, I will be surprised. 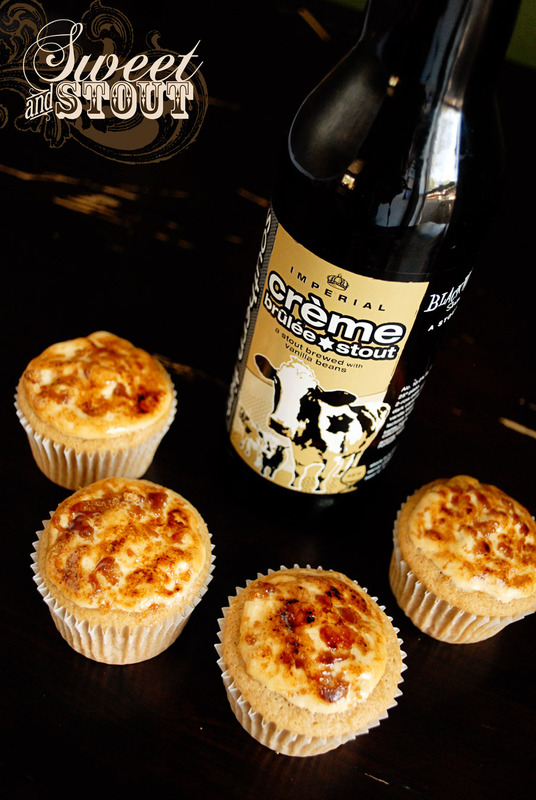 We were feeling fancy this weekend, so we opened a bottle of Crème Brûlée Stout from Southern Tier Brewing Company and made some cupcakes with it (and drank the rest). If you’ve never had this beer, I highly recommend it. 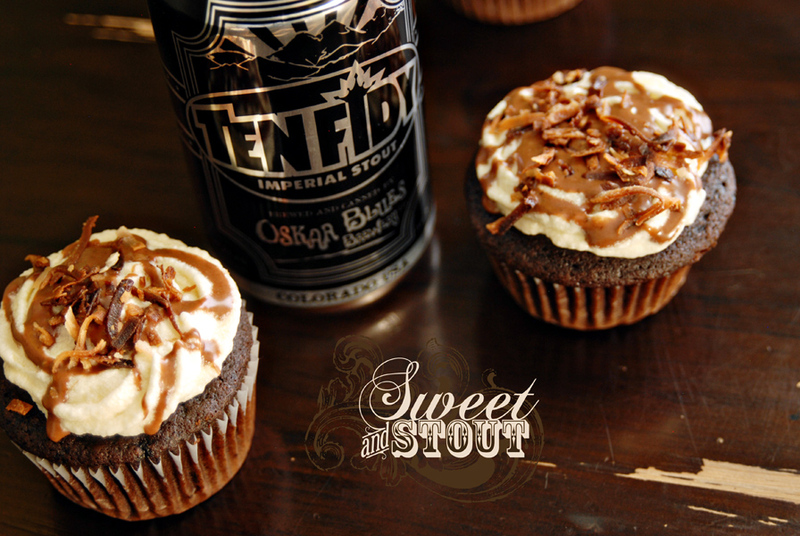 It’s a sweet, creamy, delicious stout that should not be missed. It added just the right amount of flavor to our cake recipe. To say the least, we were really excited to bake these & try them. Last Thursday, Dylan and I met up with a food writer for the Spokesman Review for an interview. She told us she was going to have a photographer come over to the house on Sunday to take some pictures of us while baking. So we were really trying to make this cupcakes turn out both picture worthy and delicious. 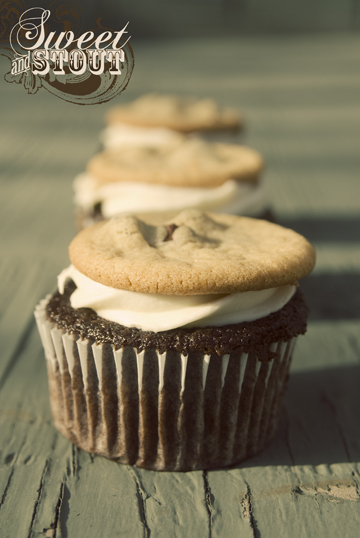 I’m pretty sure we succeeded – the photographer really enjoyed the cupcake, and I think he got some really cool shots. 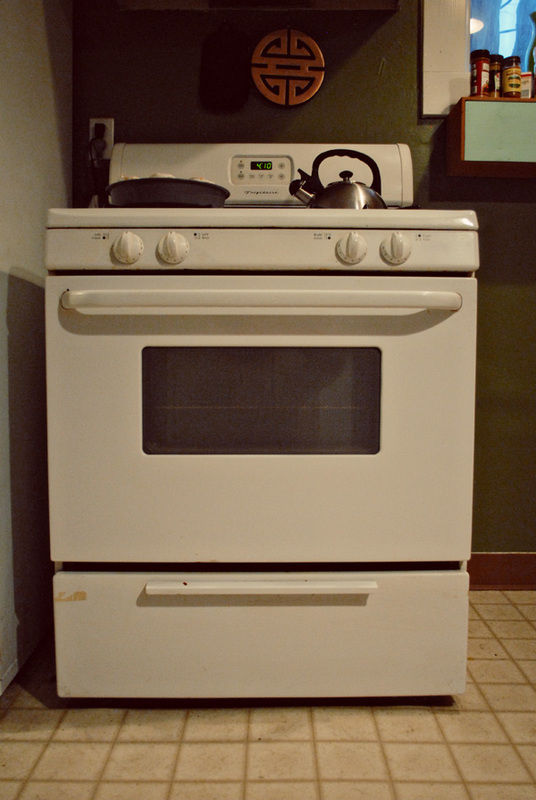 It’s kind of hard to imagine a big photo shoot going on in our small (really small) kitchen! 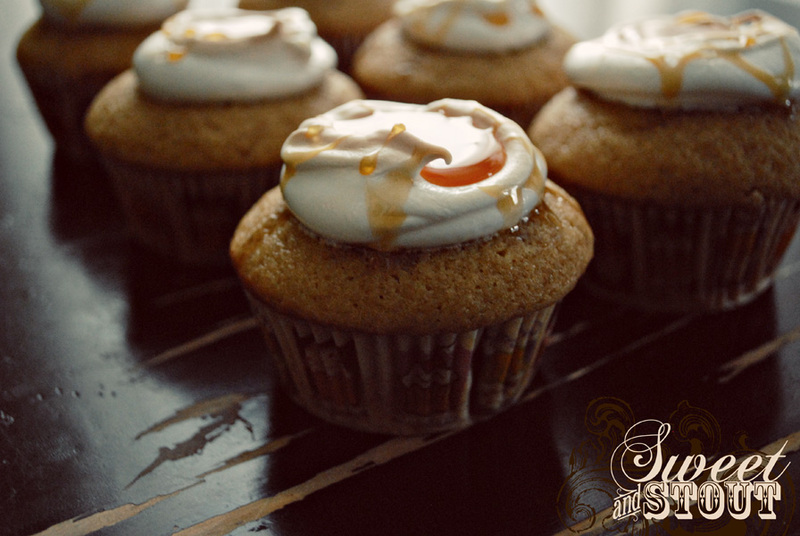 These cupcakes were definitely rich, to say the least, but (and I’ve been saying this a lot lately) they are definitely in my top 10 cupcakes that we’ve ever made. I think I may need to start expanding our offerings list when we actually start doing business. Cake, beer and fire… now that’s what I call a good time. Speaking of business, last Friday (amazingly and unexpectedly) we reached our goal on kickstarter! Actually, we’re sitting at 116% funded right now, the donations kept coming in after we hit our original goal. 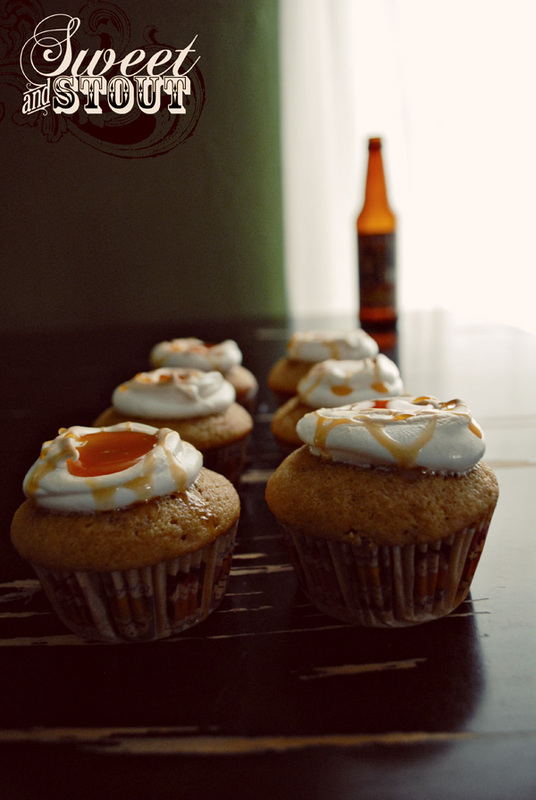 We are so grateful to everyone who has donated – definitely feeling the beer cupcake love. We still have to wait until our campaign ends (October 10th) until we actually receive your generous donations, so you can look forward to us getting to work soon after that. 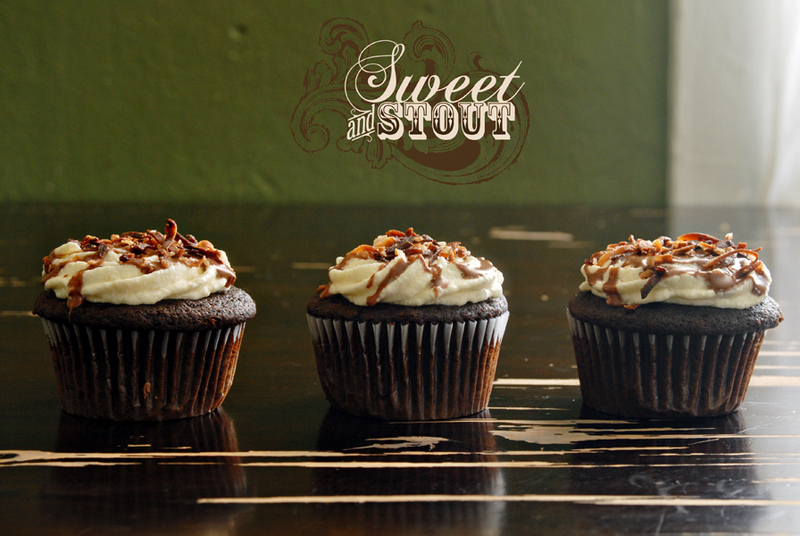 We are beyond excited to move forward with Sweet and Stout, thank you again for being a huge part of it!